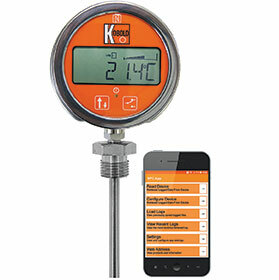 Kobold’s DTE series of digital temperature gauges offers a wide range of industrial and analytical possibilities in applications where high accuracy and clear indication is required, and where alarm control and displayed messaging is useful, as in controlled environments such as hospitals and scientific laboratories. In addition, the range also incorporates data logging, is accessible via NFC interface with mobile devices, and is USB PC configurable. One of the key aspects is the mechanical case mounting options that follows the traditional Bimetal, Nitrogen Actuated, and Mercury (now prohibited) mechanical gauges. • 5000-point logger with USB interface. • NFC interface for reading log, sync clock/start new log. • Android app for transmission of data via e-mail. • 7x32 character messages from user set message library. • Dual alarm relays Max/Min information. The advanced features and versatility of the DTE offers new solutions for many applications, typically: process and plant engineering, storage, building management systems, water industries, food and beverage, biomass and HVAC.